(AKRON, OHIO) May 8, 2015 - The Akron RubberDucks are partnering with Northeast Ohio Roy Hobbs Baseball again to bring back "Challenger Day" on Sunday, May 10 at 12 p.m., prior to the finale of the three-game series between the Akron RubberDucks and the Binghamton Mets, which starts at 2:05 p.m. It will be the 17th year Challenger Day will be hosted at Canal Park, with the annual tradition started in 1999. 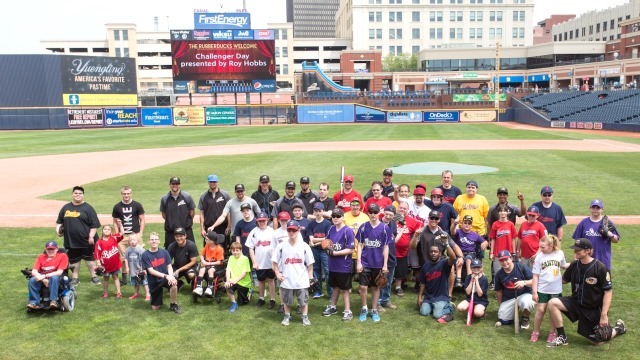 Challenger Day provides an opportunity for kids and adults with developmental disabilities to play a baseball game at Canal Park, and to meet and be cheered on by some of the RubberDucks players. Each participant will get to hit and play in the field, and get to experience what it is like to be a professional ballplayer for a day. Ages range from as young as seven to as old as 25. "Challenger Day is one of the annual highlights of our schedule," said RubberDucks general manager Jim Pfander. "It is important to be able to give these young baseball players a chance to play at a facility like Canal Park, but the real fun comes from the smiles on the athletes' faces and those on the faces of the RubberDucks players who are there to cheer them on." Challenger Day participants play in area Little League programs that include the Challenger program or in the Ohio Challenged Athletes program. Participants this year will be from teams in Hudson, Tallmadge, Green, Canton, Tuscarawas County, Barberton, including players from Akron and Cuyahoga Falls. "The opportunity for these special athletes play baseball with the RubberDucks at Canal Park never ceases to be special," said Tom Giffen, President of NEO Roy Hobbs. "We thank the RubberDucks for their support and involvement in this experience. It's memorable for the youngsters and their parents as well as the RubberDucks players." Participants are scheduled to warm up at 11:45 a.m. with the game scheduled for 12 p.m. and it will last approximately one hour. At the conclusion, a team photo will be taken of the participants and the RubberDucks who cheered them on. Gates will open at 11:15 a.m. for any spectators. Media are welcome to attend. If credentials or photos are needed, please contact director of public and media relations Adam Liberman at aliberman@akronrubberducks.com to make arrangements. The RubberDucks are the Double-A affiliate of the Cleveland Indians. For more information, call the RubberDucks at 330-253-5151 or visit www.akronrubberducks.com. The RubberDucks are on Facebook www.facebook.com/akronrubberducks and Twitter @AkronRubberDuck.